Even the bravest of souls should break a sweat when faced with horde after horde of Covenent chieftan, wraiths, and hunters. We have a first hand account of a co-op band of survivors of the vicious Halo 3: ODST Firefight mode, and it's not for the faint of heart. The first wave of Covenant was easy: Four of us against a bunch of alien meat puppets. But it was the appearance of two Covenant Wraith tanks coupled with the re-appearance of new dropships and the constant, accurate plasma blasts reigning down on us that made me nervous. The silence between waves was even more nerve-rattling. During those short windows of time (maybe 10-15 seconds), we sprinted across the green searching for ammo or any ammo-filled enemy gun we could find.The third wave of the first set brought Brutes. The fifth wave finally came, bringing the distant icon of the Brute Chieftain, with his elaborate headdress protruding into the air and the massive, powerful hammer clutched in his paw. You could hear him grunting a hundred yards away. I watched one teammate take the Chieftain’s first swing, his body like a puppet slammed 30 feet back. It took all four of us to mow him down. Sends chills down the spine, doesn't it? This account not only encourages cooperation in the Firefight, but demands it. Strategize with your team, disarm the foes, and just...survive. Firefight mode is a surefire hit with the co-op crowd. 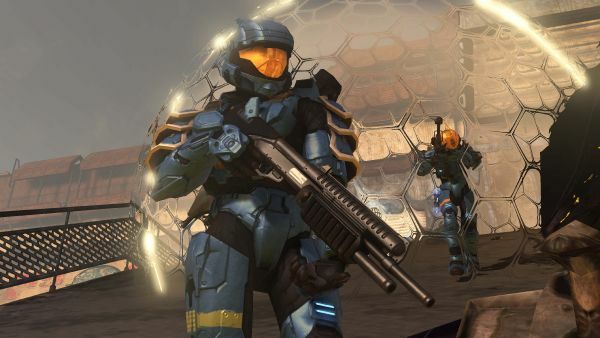 The Halo universe has all but begged for a "Firefight" survival mode. As a quick summary taken from the same brave soul who survived to share his tale. GameInsano.com fleshes out a few more details about what kind of surviving you're expected to do, aside from just saying "it's Horde mode". "[Firefight Mode] reminds most people of Gears of War 2’s Horde mode, although Survival gameplay modes have existed in fighting games for dozens of years now; they’re nothing new. But Firefight is new to Halo, and it’s a logical extension of the Halo play style that bolsters co-op play and camaraderie, as up to four players team up to fight endless waves of Covenant enemies." "In Bungie’s version of survival mode, you and three other ODST soldiers start with a single suppressed SMG and (scoped) pistol each, and you’ll fight off five waves of Covenant enemies, each wave separated by about 15 to 20 seconds before the next wave hits. Your team shares a pool of seven total lives (shown the upper right hand corner); meaning you get seven lives to survive three sets of five waves before Bungie rewards you with a Bonus Round. Survive that, and you’ll get new ammo, extra health, and new lives." For those that had questions about the vehicles in the Firefight mode, Gameinsano.com addresses that especially for you. "In each of the three Firefight maps shown, not one included drivable vehicles. Bakken explained that a handful of the other Firefight maps were large enough to include vehicles, specifically citing Warthogs. He pointed out, however, that you couldn’t jack a Wraith tank, which I so desperately wanted to do in Security Zone; you can however, plant a bomb to destroy it. Jacking the Wraith tanks was something Bungie toyed with early on, but it quickly became apparent, as Bakken pointed out, that it threw the game out of balance and changed things for the worse." If Firefight Mode doesn't sound like a reason to buy Halo 3: ODST, I don't know what does. Well, I guess the Allstar cast, or the confirmed 4 player co-op in the story might be other reasons. Okay, there are a lot of reasons to go ahead with this one, Firefight is just a really nice addition to an already amazing franchise.